I currently have three kids with an additional two on the way. 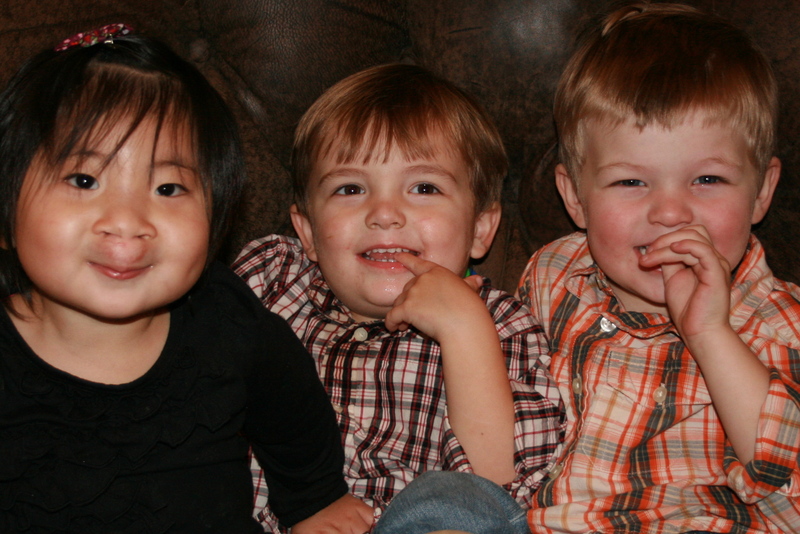 Three of my five will be boys (and they will all be under 5 years old!). I know based on experience with my sons Reed (4) and Brooks (3) what it’s like to have energetic little people running around the house. And based on that experience here is why I think little boys should grow up on hardwood wood floors. 1) Wood floors make a great race track. Cars do not roll well on carpet. This is a no-brainer. How in the world can these miniature Jimmy Johnsons reach top speeds on carpet? Tile is no better by the way, grout lines are speed bumps. Your boys will grow up feeling like they’ve been driving around an apartment complex parking lot. My guys Reed (4) left and Brooks (3) right. Playing with their cars on our wood floor is a nightly endeavor. 2) Wood floors encourage sporting. Balls do not roll well on carpet. When was the last time you saw a bowling alley lane that was carpeted or tiled? Our upstairs hallway is the perfect place to train future PBA hall-of-famers. Note: If you have a son that is likely to grow up and wear huge awkward glasses, grow an awful mustache or have a head of hair that is either disappearing or just out of control – a future as a professional bowler may be in the cards. Don’t sweat it, Walter Ray Williams, Jr. made $152,000 last year on the PBA circuit. Things could be worse. 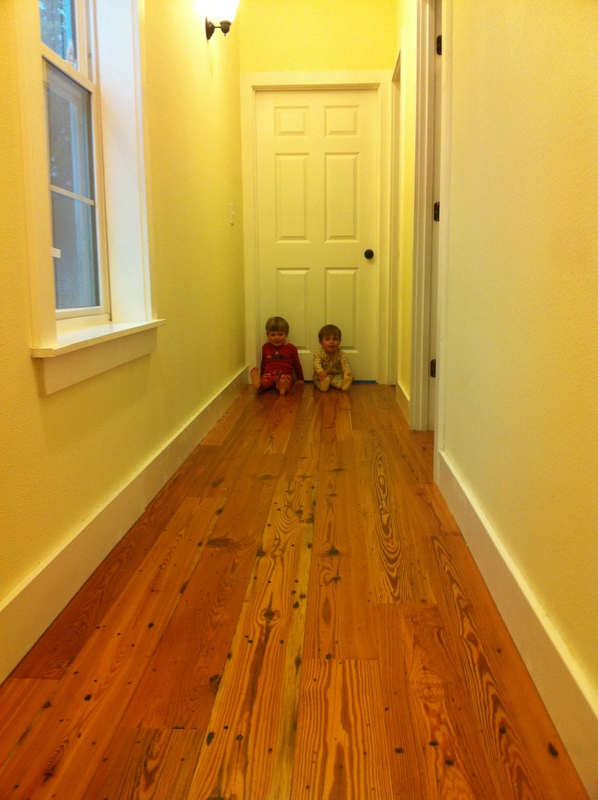 Wood floors, particularly in long hallways provide great arenas for playing. Reed and Brooks sit at one end and I’m in charge of setting up the bowling pins at the other end. 3) Wood floors are warmer than tile. Boys spend an enormous amount of time playing on the floor and while it may not be as warm to the touch as carpet, it is warmer than tile and still provides an environment conducive to points 1 and 2. I’ll admit I can’t explain the science of why wood floors feel warmer than tile but they do. It has to do with R-values, thermal conductivity and the fact that wood floors always encapsulate 6-8% moisture content. I’m sure someone can comment on this in a more scientifically convincing way, but believe me when I step from my wood floor every morning onto my bathroom tile I know this is true. 4) Wood floors are cleaner than carpet. Boys are by nature dirty creatures. Everyone knows that carpet houses between 5,000 and 10,000 dust mites per sq ft. You don’t need little boys adding anything they bring into the house to that filthy dirt trap you’re living on. Are you really comfortable having them playing inches from that nastiness? If you don’t believe me help a friend tear out old carpet some day. Disgusting. 5) Wood floors are softer than stone or tile. Boys fall down a lot, and usually at high rates of speed. While carpet may provide a soft landing, we’ve already established it’s filthy and unfit for car/ball rolling. Wood floors are a hard surface, but they break a fall better than stone or tile. 6) Wood floors help kids learn to walk. I have video evidence of this one. Here is my oldest Reed learning to walk while pushing his chair along the wood floor. So there are 6 reasons that boys should grow up on wood floors. It will ensure they learn how to walk, how to play sports, give them a joyful childhood, and keep them from cracking their heads or catching an infectious disease. Well, maybe not exactly, but if you are raising boys and you are in the process of choosing a wood floor here are a few things to consider. High grade floors with very consistent grain and very little character defects will show dents scratches and marring much more than rustic floors. Consider pine, hickory and oak and have a look at #2 and #1 grade material. Rustic floors do not mean you must have a rustic interior. Contemporary, casual, traditional and even modern settings are regularly employing rustic wood floors in their decorating themes. Soft floors will dent and ding much easier. People tend to make this a huge deal but to be honest I’m on the other side of this. I live on heart pine floors. They are very soft and after only one year they are fairly dinged and dented. However our floor is a rustic grade with lots of natural characteristics in the look of the floor, and in my opinion the dents and dings make the floor look even more vintage in the house. I’d much rather have a ding in my floor than 5000 dust mites. Furthermore I’ll always be a little sentimental of the dings in front of the shelf in the kids toy room as I know that is where they would get their trucks off the high shelf with their wiffle ball bat. Those dings tell a story. We aren’t afraid to live on our wood floors. If the dings are a big deal to you, then consider something harder. People have the impression that oak is really hard. In actuality it is one of the softer hardwoods. Maple, hickory and a myriad of exotic wood floors like Brazilian cherry, ipe, and cumaru are much denser and more resistant to dings and dents. Low gloss polyurethane finishes on wood floors hide much more marring and scratching than semi-gloss or high gloss finishes. UV oil or hard wax oil products are even better. When considering color, remember darker floors are simply going to show much more dirt than lighter toned wood floors. Think of how black cars show dirt. Grey tones are very popular on white oak and will not look like they always need to be swept. Great post. I have five boys of my own, and can confirm from my own experience that hardwood floors underfoot are the best way to go. Each ding, dent and scratch tells a story, and it is nice to know that they are not sharing their play surface with legions of dust mites. I loved the shot of your two little guys at the end of the long hallway!